Surrounded by wildlife, your presence in the Okavango Delta as you enjoy a spot of fishing will not go unnoticed - every creature in the vicinity will know you are there! Crocodiles and Hippos will be especially watchful, this is their domain and don't they know it.... 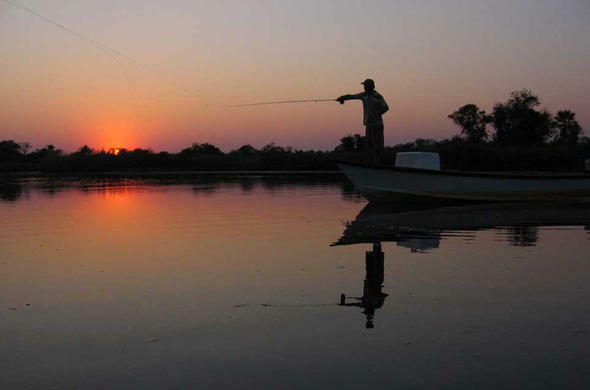 Fishing in the Okavango Delta may sound extreme when you consider that you are in a remote wilderness which is known for its high density of wildlife. You are out-numbered for sure, but a fishing safari here is more about what you gain from the overall experience, and less about what you catch. 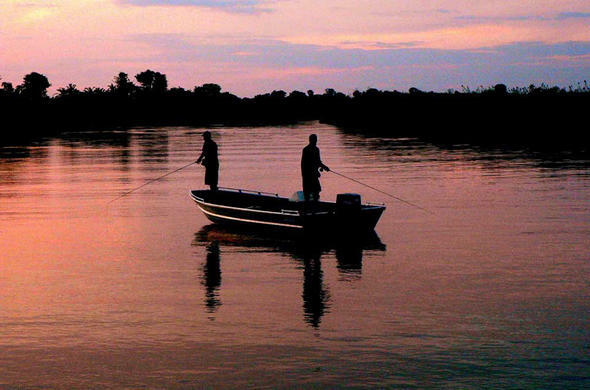 When you set off in a motor boat with your fishing guide you are in a unique position to take in the magnificent scenery in the heart of the Delta. With a drink at your elbow and such beauty all around you can truly relax in the silence and peace of this watery paradise, at the heart of the Kalahari Desert. Birdlife is prolific and the variety of species is astounding - African Fish Eagle and Pel's Fishing Owl are just some of the birds sharing your penchant for fishing. If you stand at the water's edge and cast your line, you could be sharing the space with Buffalo and Elephant. There are about 70 fish species in the Okavango Delta. Common species include Tilapia, Bass and Bream, although many anglers go after the ferocious river-bred Tiger Fish, found in some lagoons and where the Okavango River feeds into the Delta. The African Pike is another great fighting fish, but you'll also be able to catch huge Catfish into the bargain. Fishing is especially good between March and December. A number of lodges offer fishing as a standard safari activity and some basic equipment may be supplied for beginners, but for the avid angler it is best to bring your own gear (mainly light tackle is recommended). 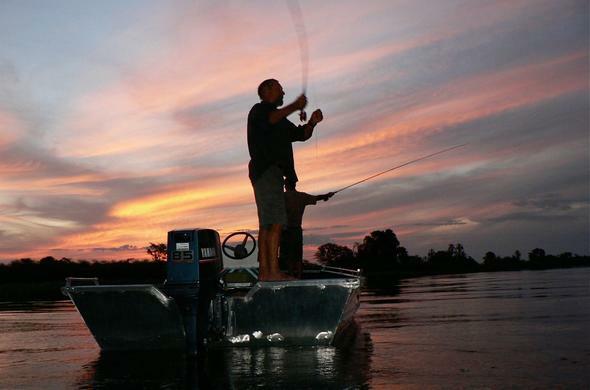 Fishing by law in the Delta is protected by a 'catch and release' system. 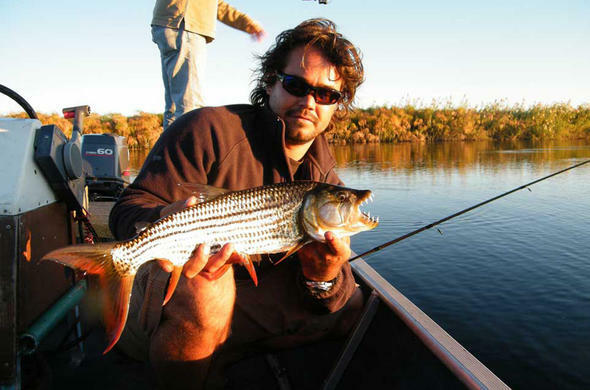 Here are some great camp suggestions for fishing enthusiasts going on an Okavango fishing trip. This beautiful camp overlooks a lagoon from Xaxaba Island in a remote setting deep in the Central Okavango. 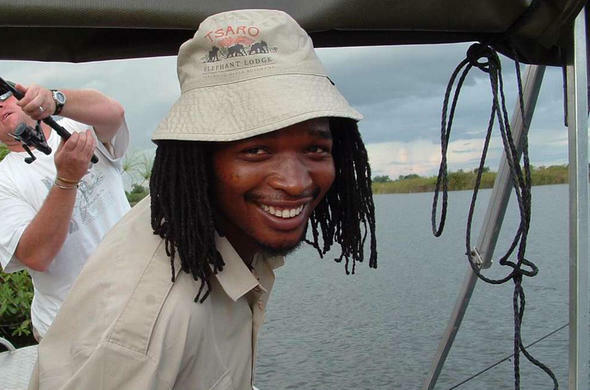 Eagle Island Camp is a secluded retreat and offers comprehensive activities including fishing safaris with a trained guide, mokoro safaris (traditional canoes with a poler / guide), walking safaris, birding, cultural visits and scenic flights. 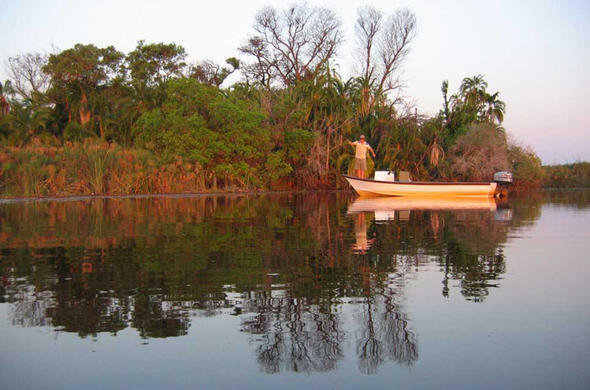 Kanana is situated on the Xudum River in the south-west Okavango. The camp offers both wet and dry habitats which attract a wide variety of wildlife year round. 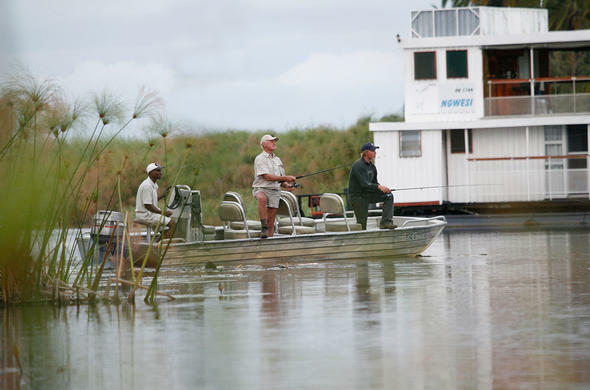 At Kanana you can enjoy fly or spin fishing in the permanent waters, motor-boating, mokoro excursions (guided trips in traditional canoes), game drives (also night drives) when water levels permit, guided walks, superb birding including visits to one of the largest heronries in the Okavango. Enjoy peace and privacy at Xugana Island Lodge, which is set under a lush tree canopy overlooking the Xugana Lagoon. There are a number of other islands in this concession and you can explore the scenic surroundings by motorboat, mokoro (dug-out canoe) or on foot with fascinating island walks. Bird watching is excellent as is the fishing for Bream and Tiger Fish.